Oh boy! I came across something in today’s reading that can be confusing and may even appear like a contradiction. 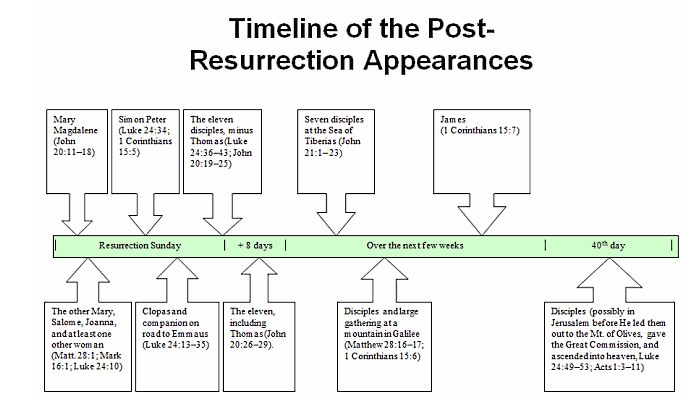 “Do not marvel at this, for an hour is coming when all who are in the tombs will hear his voice and come out, those who have done good to the resurrection of life (good works function as evidence of true faith), and those who have done evil to the resurrection of judgement (lacking good works shows an absence of true faith - as per my footnote). The confusing part to me in that verse is..”those in the tombs”. I am reminded of what we just read in Luke 20:38 (and also found in Mark 12:26 & Matt. 22:32). So which is it? Are the dead alive now or will they rise from the tombs when the “hour comes”? Well, I found two interesting commentaries that speak to that. That seems reasonable, but at the transfiguration, Moses & Elijah appeared as “two men who stood with him” (Luke 9:33). So they had some sort of body that was recognizable to who they were. In light of these two commentaries, the two verses don’t contradict each other, they add to each other. Our souls live to God as soon as we hear and believe (vs. 25); our eternity has started (vs. 20); death will not separate us form the love of God (Rom 8:38), we will not experience judgement as believers (John 5:24) and we will live with Christ (Rom 6:8 & Phil 1:21). All that starts now. Maybe our earthly bodies, changed, will catch up to us later (Phil 3:21) or maybe time is different outside of earthly time….who knows? I like what Matthew Henry said, it will be a “happy state” either way! I read quite a few commentaries to see what others had to say about how “God seeks”. I didn’t find much. Everybody focused more on what the right kind of worshiper is. I was just fascinated with the fact that God is looking for them!!! 1.) Such worshippers are very rare, and seldom found. 2.) That such worship is necessary and what the God of heaven requires and insists on. Anyway, maybe I should just give a brief summary of what I have read in commentaries so that we are all on the same page as to what worshipping in spirit and truth entails. First let me start with “truth”. So, God is seeking those who worship Jesus. In fact he insists on it! (…”must worship in spirit and truth’ (vs. 24). In addition to the fact that it must be worship to Jesus, it also must be correct worship. So, let’s look at “spirit”. Worship in spirit is living every moment giving glory to God because of who he is and what he has done for you (1 Cor. 10:31). One who is born again (in spirit) loves God, honors and obey’s God in their actions and proclaims God. That is worship in the Spirit. God is looking for the born again, Christ followers who worship Him with their whole life. It makes me think of what Jesus said in Luke 18:8, “However, when the Son of Man comes, will he find faith on the earth?” He’s seeking them out….will he find them?……. Reading just one chapter a day really gets me to take a closer look at some very familiar verses. Today we come to one of the most well known verses in the Bible ~ John 3:16! Surprisingly, I read the verses that followed as if I had never noticed them before. Isn’t it odd that everybody grasps onto the “believe” part of 3:16, yet ignore the “works” part of the verses that follow? I say “isn’t it odd” but I actually mean, can you see Satan is using his strategy of using scripture to trick people? He has used this verse to lull people into a way of thinking that if they just believe (but not turn from their sin) they are “in”. He has made this verse so popular that even non-Christians can quote it, yet they have no idea what the proceeding verses say. Notice how John goes from speaking of belief to almost defining what belief entails? I’m glad to be reading just one chapter today, so that I can take the time to see these gems of truth! Thank you, John, for sitting down nearly 50 years after Jesus was resurrected, to write the introduction to your book! I think John made it abundantly clear as to who Jesus is! I love those verses!! I also love how he tied the first sentence of his book to the first sentence of the Genesis. John’s opening statements form the foundation of what we know as the trinity. This concept is hard for some to understand. Muslims have a hard time understanding that Christians are monotheistic, as they say they are. They believe that Allah is the only God (even though they have “deified’ Muhammad). So, when they hear that Christians worship Christ and God, they think we practice polytheism, which is idolatry. That is why I love John’s intro so much. It clarifies that we worship the one true God. We still obey, “You shall have no other God before me,” (Ex. 20:3) Maybe if they (and others) read the intro to John, they would get it! 😀…..But….perhaps not….John, later in his book, tries again to clarify by quoting Jesus, “I and the Father are one” (10:30), but the people of that time didn’t like hearing that. I guess some things never change. Yet, “Whoever has ears, let them hear”! This last chapter really needs to be read in the context of the other gospel accounts. Although Luke has been detailed in his whole account, he is quite abbreviated here in the last chapter. 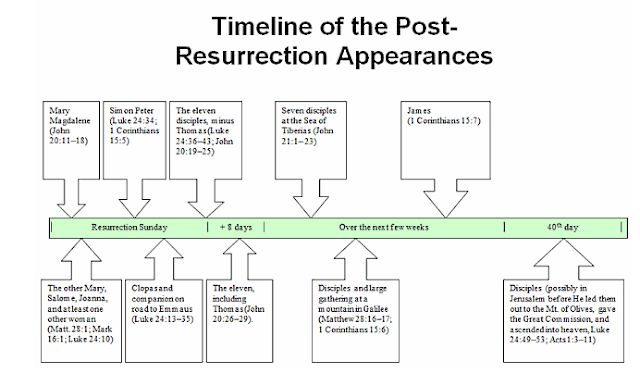 If we just read Luke’s account we would be left thinking that the two on the road to Emma's went back to Jerusalem the evening that Jesus rose from the dead (which they did- 24:33), then he appeared to them all (vs 36) and led them out to Bethany (vs 51), all on the same evening! With that sentence in Acts, we see that Luke knew a lot happened between Jesus breaking the bread (Luke 24:35) and “as they were talking about these things (vs 36). We learn in other accounts that the disciples had left Jerusalem and went back to their work up in the Sea of Galilee, aka Tiberius (Matt. 28:16 & John 21:1). I found a time line that can be helpful to see how different accounts don’t contradict each other. The different accounts just demonstrate points of view that each writer felt were important to include. That simple sentence stood out to me; simple, but packed with meaning! 1.) Can you imagine the relief the criminal felt? The criminal feared God (vs 40). He knew he was getting what de deserved.. What mental agony he must have been feeling on top of his physical suffering! So, imagine the peace that washed over him when he heard the forgiving words of Christ! 2.) “Today you will be with me.” I think I have always kept Jesus in his ‘body form’ in my brain. I kept him in that tomb for three days and three nights, as if he was sleeping! But his soul (or spirit) was never in that tomb!! His body was, but he wasn’t. He was in paradise along with the former criminal. He also may have gone else where to take care of some business…In 1 Peter 3:18, Peter writes, “..being put to death in the flesh but made alive in the spirit, in which he went and proclaimed it the spirits in prison,…” Who knows exactly where and what he did when he left his body, but it was an epiphany to me, as I read today, there there was one place his soul was not…in the tomb.